Finally it can be said. I have now driven half-way to Saudi Arabia. It seems there is a 15 mile causeway linking Bahrain to the Saudi mainland, with an island in the middle. On the island is the border station, and on each side of the border is a rest area. In each rest area is a tower with a large disk about three storeys up, containing restaurants, and another about ten or fifteen storeys up containing an observation deck. The one on the Bahraini side has red neon around each disk and the one on the Saudi side has green neon. One night I decided to go there for dinner. I got there at about 6:30 but it turns out that the restaurant doesn’t open for dinner until 7:30. So I went up to the observation deck and read a book by a Bahraini woman reminiscing about how things have changed here during her lifetime . It seemed appropriate, and was quite enjoyable. I could see lights in the distance from Saudi Arabia in one direction and Bahrain in the other. When I finally got in to eat, the food was wonderful! I had a mushroom soup with onions and lemon juice, and a byriani (an Indian rice dish) full of all kinds of goodies. The main ingredient was shrimp, but it also had assorted greens of all different flavors, nuts, and even a hard boiled egg. It tasted great. And I had Turkish coffee to finish it all off. The first time I took the plunge to eat local food was at one of those grim looking restaurants on one of the inner city streets in Manama. Its decor was, shall we say, basic. The tables were topped with formica and the chairs were plastic molded. The menu was hand-painted on the wall in English and Hindi. Chicken Koorma was listed, and since I knew what that was, I asked for that — but they weren’t serving it today. So I asked for Chicken Curry, which apparently they had. Then the waiter asked me if I wanted … or … I never did figure out what he was saying. So I said sure, and got rice. It was actually reasonably tasty, and I still felt OK the next day. I had more money left over at the end of one day than I expected, so I decided to treat myself to the buffet in the hotel restaurant. It cost $35.00, including wine, coffee and the service charge, but what a spread! For the salad course I had some ground up green stuff, a nearly normal green salad, some sort of yogurty/cheesy thing, and various other pickled veggies. Then for the main course I had byriani and kurma (the "koorma" I couldn’t get at the other place) from India, a veal thing, beef with broccoli (a Chinese touch) and something else I can’t remember. By the time I finished, I was so stuffed, I could barely squeeze in the strawberry mousse for dessert. 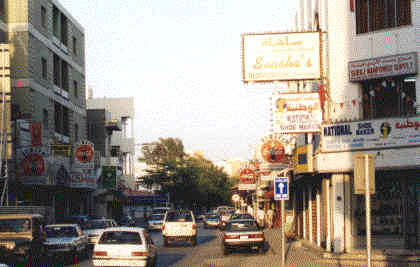 Near my hotel is a pleasant little business street, Osama Bin Ziad Road, where I get film developed and my laundry done. It has a bookstore, a grocery store, a Ferrari dealer (! ), several video and music stores — and a series of booths selling strange looking food. The strange looking food I avoided for most of my stay here. Last week, however, I had dinner with a couple who are good friends with the family who lives across the street from us in Houston. They knew my street and told me that I should not be shy about buying a "shawarma" from one of the little stands. Sanitation is not a problem here. A shawarma turned out to be a kind of Bahraini taco in pita bread, with beef or chicken, lettuce, tomato, and secret sauce. At 150 fils (about 40 cents) each, this is one cheap (and very tasty) dinner! Of course when you add the stop at Baskin Robbins down the street(no, this place is not without civilization), where a Cappuccino Cream cone costs 500 fils ($1.35), then the dinner becomes a bit more expensive. And of course there was that stop at the pub for a 2 Dinar beer ($5.40) which now constitutes serious extravagance. But I had some money left over, so it’s ok.